Biodiesel. Photo: Daniel Ciolkosz, Penn State. eXtension Biodiesel Resources about Feedstocks, Processing, Safety, and Using Biodiesel. Alternative and Advanced Fuels: Biodiesel Information from the U.S. Department of Energy. Bioenergy Atlas Two interactive maps, BioPower and BioFuels, which allow you to compare and analyze biomass feedstocks, biopower and biofuels data from the U.S. Department of Energy (DOE), U.S. Environmental Protection Agency (EPA), and the U.S. Department of Agriculture. Energy Information Adminstration’s Renewable & Alternative Fuels Homepage Statistics on renewable fuels production and consumption. National Biodiesel Board National trade association representing the biodiesel industry in the United States. Biodiesel Education Program, University of Idaho Provides unbiased, science-based information for biodiesel producers and distributors, vehicle fleet operators, and the general public. Biodiesel Safety and Best Management Practices for Small-Scale Noncommercial Use and Production. Penn State College of Agricultural Sciences. 2008. Piedmont Biofuels Biofuels curriculum and general information on biodiesel from a commercial biofuels company. State Level Biodiesel Incentives & Laws State by state listing of incentives and laws provided by the U.S. Department of Energy Alternative Fuels and Advanced Vehicles Data Center. Federal Biodiesel Incentives & Laws List of federal biodiesel incentives and laws provided by the U.S. Department of Energy Alternative Fuels and Advanced Vehicles Data Center. National Agricultural Law Center Renewable Energy Reading Room Virtual library of legal resources related to renewable energy that contains information specific to agriculture and energy, including an overview article, major statutes and regulations, case law, Center publications, materials from many government agencies and additional resources provided by the National Agricultural Law Center. Biomass-to-Biofuels Resources Vermont Sustainable Jobs Fund. Case Studies and Feasibility Analysis reports of small scale biodiesel production. Sustainable Biodiesel Alliance — this Texas-based organization promotes environmental, social, and economic sustainability of biodiesel. They aim to create certification for sustainability in biodiesel. Freeways to Fuel — Utah State University and the Utah Department of Transportation are experimenting with growing oilseed crops on unused land near roadways, airports, railroads, and construction sites. Biofuels Incentives: A Summary of Federal Programs — this 18-page publication is published by the Congressional Research Service. Biodiesel: An Alternative Fuel for Compression Ignition Engines This booklet is based on a lecture series presented in 2007 at the Agricultural Equipment Technology Conference. Includes information on biodiesel history, chemistry, processing, and use. Building a Successful Biodiesel Business This comprehensive book covers biodiesel production, developing a business, workplace safety issues, and environmental regulations. Authors are experts from Iowa State University, University of Idaho, USDA/NCAUR, and Renewable Products Development Laboratory. Biodiesel Handling and Use Guide (pdf 1.4MB) 4th Edition. This 50-page publication from the National Renewable Energy Laboratory is considered the definitive publication on biodiesel handling and use. 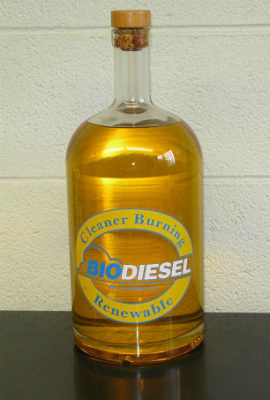 It is intended for those who blend, distribute, and use biodiesel. Biodiesel – Do-it-yourself Production Basics ATTRA National Sustainable Agriculture Information Service, 2009. Small-scale Biodiesel Production and Use North Dakota State University Extension Service. Comprehensive overview, including oilseed preparation, turning oil into biodiesel, quality issues, economics of biodiesel production, use in engines, and storage. Biodiesel: The Sustainability Dimensions ATTRA National Sustainable Agriculture Information Service, 2006. Surveys various dimensions of biodiesel production and use, including net energy balance, sustainable bioenergy crops, scale of production, consumer access, and the economics of biodiesel. Promise and Pitfalls of Biofuels Jobs Editorial in Biofuels magazine points out that small-scale biofuels production is likely to create more sustainable jobs than large-scale production. The Water Footprint of Bioenergy This article, published by the National Academy of Sciences of the United States, provides information on water usage of various crops that are or could be used for biofuels. Biodiesel Production for On-Farm Use: A Curriculum for Agricultural Producers. ATTRA National Sustainable Agriculture Information Service, 2008. Covers the chemistry of biodiesel and various feedstocks. Also presents several case studies of small-scale biodiesel production. Guidance for Biodiesel Producers and Biodiesel Blenders/Users EPA Guidance Document citing specific regulations that all biodiesel producers should be aware of. Ohio: Want to Start a Biodiesel Production Operation? Environmental Compliance Basics Publication of the Ohio Environmental Protection Agency outlining legal issues and environmental compliance concerns for biodiesel producers in Ohio. Virginia Biodiesel Environmental Compliance Primer Publication of the Virginia Department of Environmental Quality outlining legal issues and environmental compliance concerns for biodiesel producers in Virginia. Pahl, Greg (2008). Biodiesel: Growing a New Energy Economy, 2nd Edition. White River Junction, VT: Chelsea Green Publishing Company. This is a history of biodiesel in the U.S and around the world. Worldwatch Institute (2007). Biofuels for Transport: Global Potential and Implications for Sustainable Energy and Agriculture. London: Earthscan. A global overview of the biofuels industry from a social and environmental perspective. Biodiesel Safety video A 10-minute video that helps home biodiesel producers to understand the safety precautions that must be taken when working with the chemicals used to produce biodiesel. Getting Started in Farm-Scale Biodiesel Production A one-hour video from the National Sustainable Agriculture Information Service. DIY Biodiesel: Keeping it Safe, Keeping it Legal The second installment of the biodiesel series from the National Sustainable Agriculture Information Service. Energy Independence: On-Farm Biodiesel Fuel Production — a 16-minute video about a Vermont farmer who produces biodiesel for on-farm use from sunflowers and canola seeds that he grows himself. Biodiesel Magazine— this magazine aims to support the growth of the biodiesel industry. Biofuels Magazine — published by Future Science, this is a peer-reviewed journal providing commentary and analysis on biofuels research. Agricultural Marketing Resource Center: Oilseed Case Study and Decision Making Software The opportunities and challenges faced by a small scale oilseed processor located in Northwest Montana are examined this case study. Decision making software that allows users to enter their own capital and operating costs is also provided. Agricultural Marketing Resource Center: Biodiesel Case Study and Decision Making Software The opportunities and challenges faced by a small scale biodiesel producer located in western Montana are examined this case study. Decision making software that allows users to enter their own capital and operating costs is also provided. On-Farm Oilseed and Biodiesel Production at State Line Farm, Shaftsbury VT This case study by the Vermont Sustainable Jobs Funds provides details of the on-farm pilot project to develop a community-scale oil seed processing and biodiesel producing facility of appropriate scale to New England farms. Bio-Diesel Plant Location Decision This case study from the University of Idaho is a lesson plan suitable for undergraduate seniors. Oilseed Cost and Profit Calculator – The Vermont Oilseed Crop Production Cost and Profit Calculator is intended to allow farmers to assess potential costs and profits associated with oilseed production. The tool is based in a Microsoft Excel® spreadsheet and uses a simple, easy to use interface to collect cost factors. University of Wisconsin Community Impact of Biodiesel and Bioethanol Plants Calculator – The community-decision software (BDBE) calculates the impact of siting a bioenergy plant in your community. The program is designed for Extension educators and local decision makers to evaluate expected community impacts based on three different activities: 1) total plant employment, 2) total plant sales, and 3) total income earned by plant employees. RenReRe Renewable Energy and Biodiesel Curriculum for Ages 8-12 — this free curriculum was written for 4-H clubs, but can be used by elementary school teachers as well.